Who has not enjoyed a summer picnic in the shade of a tree, watched birds nesting, or listened to leaves as they rustle and whisper in the wind? Life is a garden when we fill it with trees that cool the earth. A garden without trees is a great loss, a city without trees, sadness, and a country without natural and urban forests, a tragedy. Why should you be planting trees in your garden? They add beauty to the landscape, provide a habitat for wildlife, and shade our homes. Trees are nature's air-conditioners, whose leaves and branches slow the wind, lessen noise, and catch the slightest breeze, creating air movement. They also help reduce soil erosion and slow down water run-off and improve air quality by removing and storing carbon and releasing oxygen. A tree in the right place is a great asset, linking the garden to the larger landscape beyond its borders. Landscapers often refer to trees as 'ceiling' plants because they create an overhead canopy and hold a design together. When moving to a property with established trees, don't rush into removing them. Identify them and the reason why they were planted there in the first place. It may be for shade, for protecting tender plants, for hiding an undesirable view, for their beautiful flowers, autumn colour or fruit. 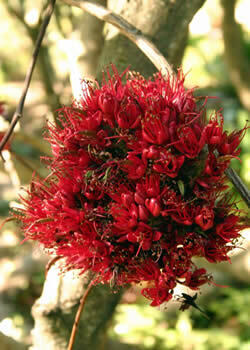 When buying a tree, choose one that suits your climatic conditions, has a pleasing shape, and is healthy. Check the label for approximate size and spread, as well as the root system, as even small trees can have extensive and invasive root systems that can damage drains and foundations and lift driveways. Allow sufficient space for a tree to grow to its ultimate size. Give your tree a good start by digging a large hole, 60cm square, and deep enough to take the root ball. Water the hole, as well as the tree in its container the day before planting. Mix in a generous amount of compost with some of the topsoil, and a handful of planting fertiliser, and replace in the hole. Plant the tree at the depth at which it originally grew in the container. Fill in with the remaining topsoil and water thoroughly. If the tree will not stand upright on its own, tie to two strong stakes inserted on either side of the trunk. 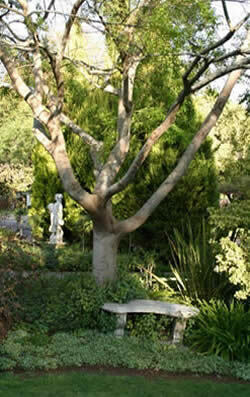 Do not 'push' young trees into growing too fast, as the wood can become soft and bend and break easily. Water thoroughly twice a week and fertilise with an organic fertiliser. Light watering only encourages surface roots that cannot cope with drought and do not anchor the tree. Feeding should extend to the drip line of the branches, as the roots extend beyond the branch ends. Mulching this area, keeping away from the trunk, is also beneficial as it retains moisture in the soil. Indigenous flat crown (Albizia adianthifolia), paperback thorn (Acacia sieberana), Cape chestnut (Calodendrum capense), and frost tender exotic flamboyant (Delonix regia) will spread a welcome canopy of shade in summer. Celtis africana can reach 10 to 12m in height, and wild pear (Dombeya rotundifolia) grows 5-6m in cultivation and is covered in white flowers in spring. The 6m-tall white karee (Searsia pendulina syn. 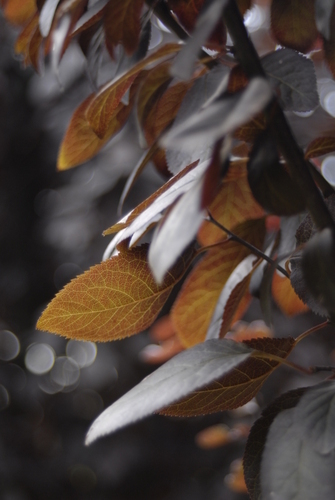 Rhus pendulina) has an attractive growth habit, and the 5m-tall karee (Searsia lancea syn. Rhus lancea) attracts butterflies and birds. The 5m-tall weeping boerbean (Schotia brachypetala) and the tree fuchsia (Halleria lucida) have red flowers that attract sunbirds. The tree wisteria (Bolusanthus speciosus) grows 5m tall, has mauve wisteria-like flower trusses in spring, and the ornamental cherry, prunus and crab apple (malus) also have spring blossom. 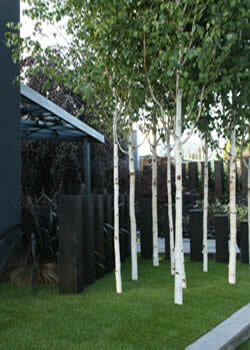 Trees with slender form, such as the lavender tree (Heteropyxis natalensis) and silver birch (Betula pendula), when planted in a grove, will provide a canopy of light shade.